ePosters - Identification and evaluation of potentially inappropriate medication(PIM) in hospitalized geriatric patients using Beer's criteria. 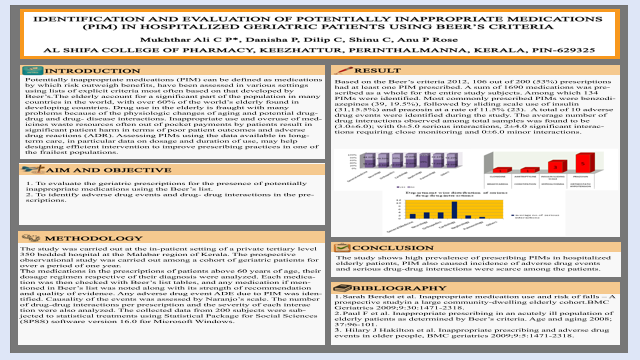 Poster Title: Identification and evaluation of potentially inappropriate medication(PIM) in hospitalized geriatric patients using Beer's criteria. Abstract: Objectives: Toidentify and evaluate the potentially inappropriate medication (PIM) in geriatric patients using Beer’s criteria and also to identify adverse drug events (ADE) due to PIMs and various drug-drug interactions. Materials and Methods: The medications in the prescriptions of patients above 60 years of age, their dosage regimen respective of their diagnosis were analyzed. Each medication was then checked with Beer’s list tables, and any medication if mentioned in Beer’s list was noted along with its strength of recommendation and quality of evidence. Any adverse drug event ADE due to PIM was identified. Causality of the events was assessed by Naranjo’s scale. The number of drug-drug interactions per prescription and the severity of each interaction were also analyzed. The collected data from 200 subjects were subjected to statistical treatments using Statistical Package for Social Sciences (SPSS) software version 16.0 for WINDOWS. Results:Based on the Beer’s criteria 2012, 106 out of 200 (53%) prescriptions had at least one PIM prescribed. A sum of 1690 medications was prescribed as a whole for the entire study subjects. Among which 134 PIMs were identified. Most commonly prescribed PIMs were benzodiazepines (39, 19.5%), followed by sliding scale use of insulin (31,15.5%) and prazosin at a rate of 11.5% (23). A total of 10 adverse drug events were identified during the study. The average number of drug interactions observed among total samples was found to be (3.0±6.0); with 0±5.0 serious interactions, 2±4.0 significant interactions requiring close monitoring and 0±6.0 minor interactions. Conclusion: The study shows high prevalence of prescribing PIMs in hospitalized elderly patients, PIM also caused incidence of adverse drug events and serious drug-drug interactions were scarce among the patients.